Set of 3 mixing bowls. The large one has a crackle finish (See close-up pic). Large Bowl measures approximately 10.25” wide x approximately 5.5” tall. Middle Bowl measures approximately 8.75” wide x 4.5” tall. Small Bowl measures approximately 7” wide x approximately 4” tall. Other than the crackle finish on the large bowl, there are no damaging cracks or chips. Automatically calculated based on location and weight. I tried to show every angle of the item for your review. 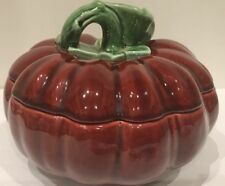 SIGNED RED CLAY POTTERY WINE COOLER - CELINA - PORTUGAL. For your consideration is this classic Portuguese pottery Wine Bottle Cooler, signed by "Celina". Red clay pottery brightly hand painted and finished with customary multiple blended white and cream glazes. All Purpose Bowl Dishwasher and microwave safe. Very Good Condition may have Light Scratch, Bottom Rim Slightly Dark. PORTUGUESE CALDAS DA RAINHA RED FISH MAJOLICA PITCHER - Bordallo Pinheiro signed. RED WHITE BLACK GREEN and BROWN majolica. RED FISH pattern. Berardos from Portugal. 7" Square Trivet. BEAUTIFUL MADE IN PORTUGAL CERAMIC RED APPLE PITCHER WITH BROWN STEM HANDLE AND GREEN LEAF ACCENT. SMALL CHIP ON BASE AS DETAILED IN PIC. Set of three beautiful nesting mixing bowls from Williams Sonoma. Deep burgundy, mulberry ribbed glaze outside, natural glaze inside. Heavy ceramic, substantial. Great for mixing. Pretty enough for serving. This pasta bowl is from the Williams and Sonoma Portugal Pasta Bowl line of Vegetables and Herbs. Style WS027 and 216419. Hard to find. Luncheon or desert or sushi or whatever. Looks like Starbuck pattern. Plus 4 mugs and 4 square bowls. Probable never used, only for display. Made in Portugal. Green accents. Red flowers. Pierced handles. Gently used. Shallow - about 1/2" deep. Scalloped edge. Nice PORTUGUESE CALDAS DA RAINHA MAJOLICA FROG PITCHER. Bordallo Pinheiro signed. GREEN, YELLOW and BROWN majolica. It contains 2 pieces the dip bowl and the dip spreader (knife). Rooster Platter Hand Painted in Portugal - Gallo - Pattern by CE Corey. Made in Portugal. Clear stems are 2" tall. Marked France on the bottom. Beautiful clear red color. If you like Italian Art you'll love this fun pitcher from Sur la Table. Details: Estate find. Measures ~8.5" tall x 7.75" wide (spout to handle) . Excellent pre-owned condition. No cracks, chips. Wonderful for use or display. Please reach out with questions. Thanks for looking. Does not have spoon. Cute little piece. Gorgeous red ceramic rooster pitcher made in Portugal by Matceramica. Would make a great gift for the rooster collector in your life. Made in Portugal. Very Clean. This is a beautiful Authentic Himark made in Portugal Red Clay Pitcher. The marker on bottom states Himark made in Portugal. It is signed by Celina. Primary colors are red, purple, yellow, green, bright blue and a touch of yellow. Grapes with flower on white, red clay. NAZARI FOR CASAFINA - PORTUGAL. RED GRAPES. 8" HAND PAINTED PLATE / WALL PLATE. NEW WITH STICKER. HAS 3 HOLES THAT CAN BE STRUNG. We want to make sure you get the best pictures and information available. We invite any suggestions, as we are fairly new at this. COVERED CASSEROLE DISH WITH LID. 8" ROUND 3 1/2" DEEP.